WhyArts will showcase the artistic talents of its teaching faculty and community partners with a spring exhibition at Gallery 1516. 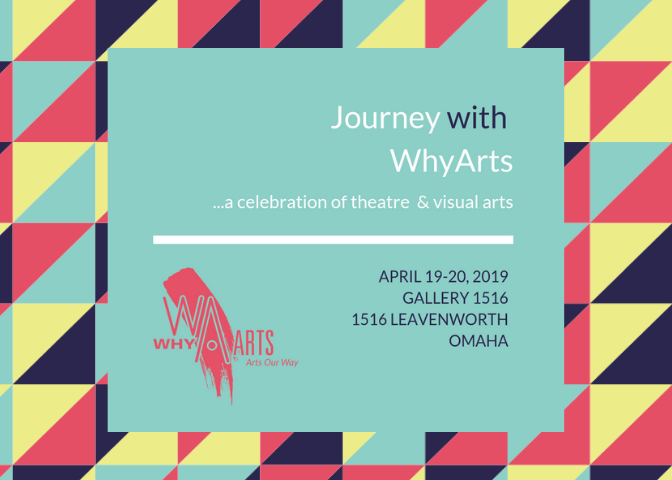 The opening reception for “Journey with WhyArts…a Celebration of Theatre & Visual Arts” is Friday, April 19, from 5:00 to 8:00pm at Gallery 1516, 1516 Leavenworth Street. The theatrical portion of the evening will include four performances centered on a “Journeys” theme by actors from four WhyArts community partners. Each performance is about eight minutes and will run from 6:00 to 7:00pm. Read more about the actors and WhyArts theatre mentors Carrie Nath and Cork Ramer below. Gotta Be Me, an Omaha 501c(3) nonprofit, was created to promote the inclusion of adults with disabilities into our communities, creating a culture that is brimming with life, dignity, and growth for all people. Outlook Nebraska is dedicated to positively impacting everyone who is blind or visually impaired. It wants to prove that those without sight or those losing their sight are capable of working, playing and living life to the fullest. QLI is dedicated to delivering life-changing rehabilitation and care for people with brain and spinal cord injuries. Th mission of the UNMC Munroe-Meyer Institute is is to be world leaders in transforming the lives of all individuals with disabilities and complex health care needs, their families and the community through outreach, engagement, premier educational programs, innovative research and extraordinary patient care. “Journey with WhyArts” is made possible by a grant from the Nebraska Arts Council. It will be on display April 19-20 at Gallery 1516 from 11:00am to 5:00pm. For more information, email Carolyn.o.anderson@gmail.com.